I make these bars two different ways depending on the company I’m serving. I make the first version for my family, it’s oil free and uses less sweetener so it tastes a bit healthier and results in a more cake-like cookie but is still delicious! The second version is good for convincing company that being vegan doesn’t mean sacrificing flavor! 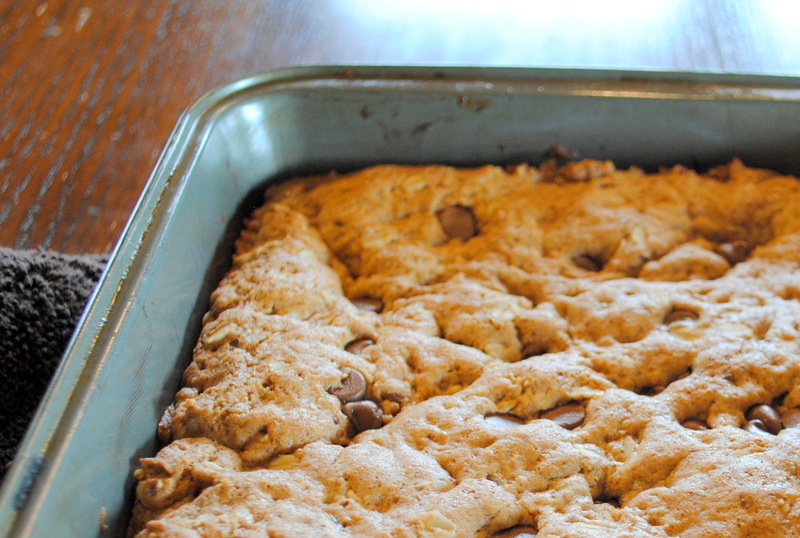 It has a small amount of oil and more (unrefined) sweetness and tastes and crunches more like traditional cookie bars, but is still relatively healthy compared to regular vegan cookies. Try both recipes to see which one is your favorite! Enjoy! Method: Preheat oven to 350 degrees. Combine flour, oats, ground flax, baking powder and salt in a large bowl with a wire whisk. Add agave, apple sauce, almond milk, vanilla and chocolate chips. Stir til just combined. Pour into an 8×8 pan. Bake for 20-25 minutes. Do not over bake, that’s the secret to the awesomeness of these babies. Let cool for 10-15 minutes then cut into 16 squares. Method: Preheat oven to 350 degrees. Combine flour, oats, raw sugar, ground flax, baking powder and salt in a large bowl with a wire whisk. Cut the coconut oil and almond butter into the flour mixture. Add agave, almond milk, vanilla and chocolate chips. Stir til just combined. Press into an 8×8 pan. Bake for 20-25 minutes. Let cool for 10-15 minutes then cut into 16 squares. this is a perfect for a post workout! This looks so nice to eat! 😀 Do you have to use the whole wheat pastry flour, or can you use another type? You could use unbleached all purpose flour, but they would be less healthy. 100% whole wheat flour has been used by others who’ve made this and they didn’t like the heavy results. Whole wheat pastry flour is just whole wheat flour ground super fine so that it behaves more like white flour in baking….. I don’t see how much baking powder in the recipe. You say t add it, but don’t have it in the ingredient list. I used to make it with baking powder and soda, I figured the baking soda is fine on it’s own so I took out that baking powder but forgot to update the method. Sorry! Fixing it now. update! messing with this recipe… gluten free versions. tried it with oat flour and a little brown rice flour… added walnuts, dried cranberries and shredded coconut… rave reviews from 16 and 13 yr olds … not to mention the hubs. Looks awesome – definitely baking them these summer holidays!! Thanx for a great blog! WOW I can’t wait to try this recipe! Your food looks delicious. Thanks for sharing, and thanks for liking my post! Thanks for liking my blog post! Your recipe look scrumptious! 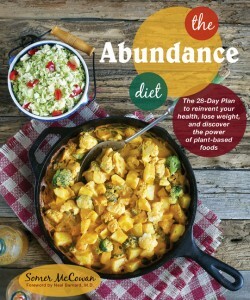 While I am not vegan, I do eat about 75% vegan so I will be checking out your blog for recipes. Thank you! these look SUPER yummy! I will have to try them! Noted! Haha! You’re pretty much going to be an expert at this recipe soon…. update: coconut flour ones actually taste fine… a little dry, but not bad. however… they will NOT be good when they get even a little stale… so NOT shipping to gluten intolerant son halfway across the country for xmas. maybe store in freezer till he comes to visit in Jan.
You are too cute. I haven’t tried coconut flour yet. I really like Cara’s gluten free mix best (in the link above) but I’m sure there’s lots of combinations that work well. I’m just not that good at gluten free baking so I stick to the ol’ standard. I made these for Christmas (the healthy version) and they were awesome. I will definitely be making them again, maybe with some fruit and nuts so I can feel even better about being addicted to them. These nearly won my brownie cook-off. Truthfully, it was a tie, but I had to pick one. It’s super easy! Hope you enjoy it! I just made them (though with gluten free flour mix). They taste wonderful, but are incredibly crumbly. What should I do to fix that? It’s the gluten free flour that made them crumbly for sure. Try adding 2 T. ground flax and 2 T. water to the mix to gel them together a bit. 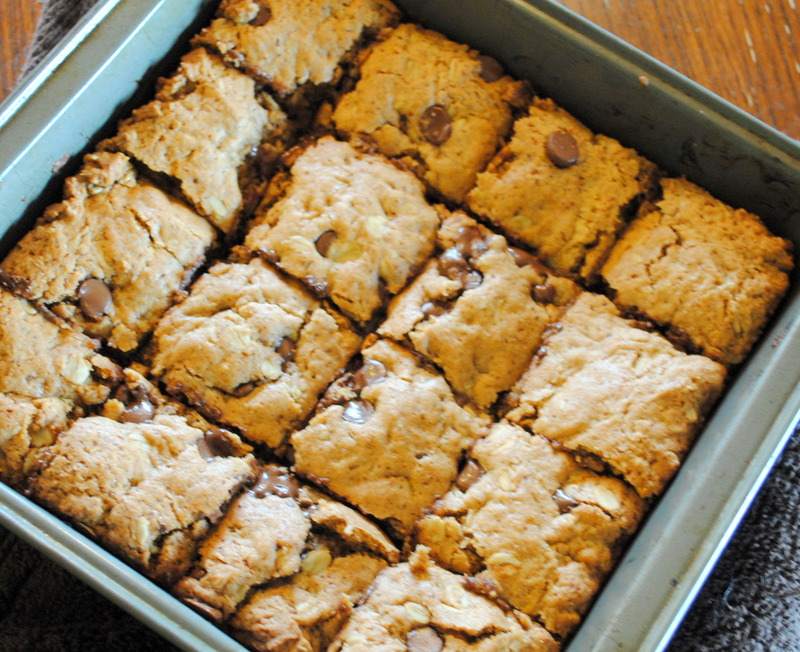 i make them with GF oat flour… plus extra 1/4 cup almond or coconut milk. i’ve decided that oat flour is the *key* for GF sweet baking. rice flour… which is nearly always the base of GF flour mixes… no matter how finely ground… seems to always make my items too grainy and crumbly. GF oat flour takes care of that… smooth and yummy. just add that extra liquid and see what you think! i’ve even created a GF gingerbread recipe using oat flour… it’s smooth and rich… does NOT taste like GF! also used it in pumpkin choc chip cookie recipe i found someplace else… working like a charm. p.p.s. correction!!! with GF oat flour, i actually *double* almond or coconut milk. (been making half-batches till i figure it out… so got used to adding 1/4 cup milk to original 1/4 cup i was using.) that is TWICE the almond or coconut milk cuz oat flour absorbs more liquid than other flours i’ve tried … both wheat versions and GF in this recipe. try it and see what you think. Oh my gosh, these look amazing! A-MAZING!! Can’t. Wait. to. Make!!! Thank you! Hey Somer, these look awesome and are in my oven right now! It would be really helpful to have ingredients in order of use in future recipes. Thanks! 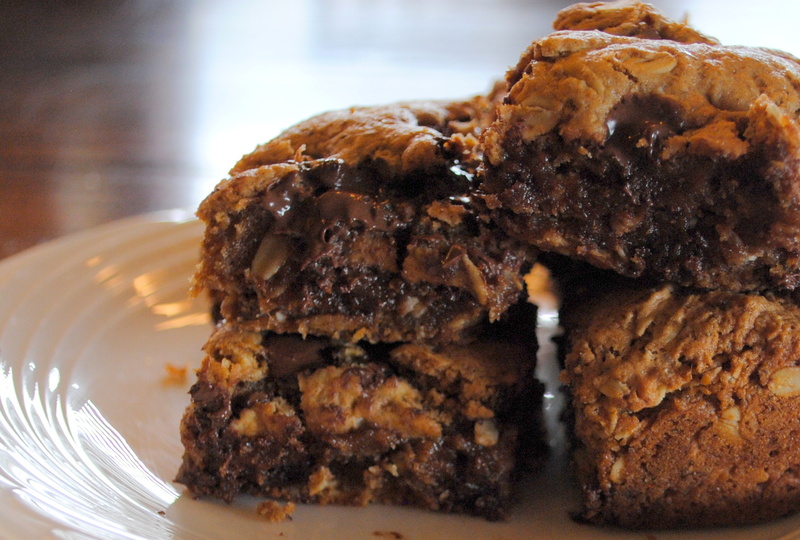 I knew I would need to make these ASAP when I saw they involved all that melty chocolate! I made these for my husband yesterday. He gobbled up the “sundae” I made him with a warmed cookie bar topped with soy vanilla ice cream and vegan chocolate syrup! seriously, best looking/ tastiest looking vegan recipes I’ve seen! YUM! I would definitely choose the Tiny Bit Naughty version! I didn’t know gluten-free oats existed. I’m going to hunt for those. We have 3 coeliacs in our family, and I’m always on the lookout for new sweets to bake for them when we have family gatherings. Use baking powder. I’ll correct the error. Thanks! Amazing, simply amazing, I made some substitutions because I didn’t have a few of the ingredients on hand, but I can’t believe this is healthy, like…how!